Before they passed away, Cory Hibbeler's parents taught their son the importance of having a strong work ethic. It's not only how Cory walked onto a Division I hockey team, but became the captain of one of the top programs in the country. When Cory Hibbeler remembers the advice his parents gave him at a young age, he tears up. The same advice that inspires teammates and coaches to follow him. The same advice that led an average college hockey team in southern Connecticut to the largest of spotlights. The same advice that keeps him going, day in and day out. Sometimes at night, Quinnipiac Head Coach Rand Pecknold and Assistant Coach Bill Riga will see Hibbeler skate on the ice alone, shooting pucks to get some more practice. They will see the team’s captain come in at 11 a.m. on a Sunday, hours after a night game, taking shots on the ice. Even when he played in junior hockey, he would be the first one in the locker room for practice and on the ice. Coaches and teammates all say Hibbeler leads by example, whether it is during a game or in the weight room. He played both forward and defense in juniors when he was with the Lincoln (Neb.) Stars, and he’s done the same for Quinnipiac. “I’m sure if we needed a goalie, he’d be out there playing,” Quinnipiac assistant captain Kellen Jones said. Hibbeler’s main dream was to play Division I hockey. He moved from Missouri to Culver, Ind., to play hockey for Culver Academy when he was just 14. “That’s when I kind of realized that he was pretty serious about this,” his sister, Nicole, said. After four years, he played for the Stars. His first year, he helped lead the team to a first-place finish in the United States Hockey League’s West Division, but still lacked offers. His second year, the team finished seventh and he yet again didn’t get many offers to play college hockey. He could have fallen back on lacrosse, as he had played at Culver, but his mom wanted her son to be happy. 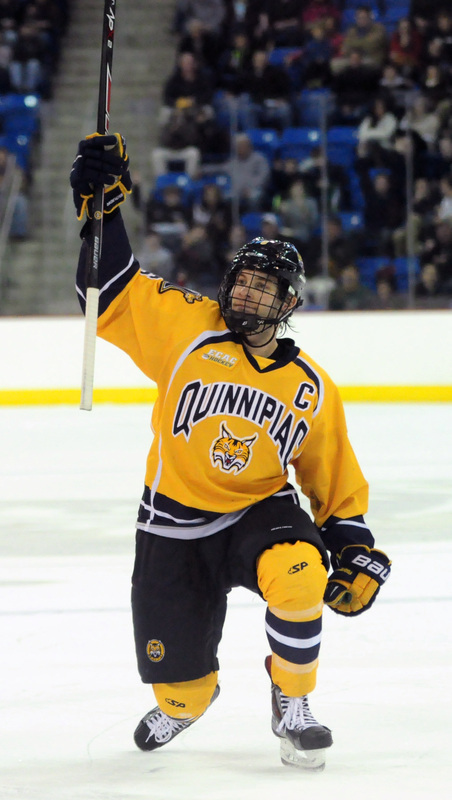 One day, then-Quinnipiac assistant coach Ben Syer called Cory, offering him a walk-on spot for the Bobcats. Cory’s mother wanted him to go. She wanted him to go to college. Cory called former Lincoln teammate Mike Dalhuisen, who had just finished his freshman year with the Bobcats. Dalhuisen was at the beach when he got a phone call from Cory. “Hey, I’m thinking about coming to Quinnipiac. How do you like it there?” Cory said. “I absolutely love it,” Dalhuisen replied, talking about hockey and the social scene. Cory told him he would call him right back. A few minutes later, Dalhuisen’s phone rang. “Hey, I just committed,” Cory told him. When Cory left for Culver, it was tough on his sister and mother, but tougher for him. While his sister was leaving for Truman State University, about a three-hour drive from their home in St. Charles, Mo., he didn’t want to be by himself, nor did he want to leave his mom by herself. His father, Michael, had died in an auto accident in January 2002 when his car had hit a patch of black ice and slid into an overpass. Cory was 12. Michael wanted Cory to play baseball, but Cory fell in love with hockey when he was 4. At a friend’s birthday party, he and his friends played roller hockey. Cory remembers the party as a “glorified street hockey game” with plastic blades, sticks and a ball, but he loved how fast-paced it was compared to baseball. The next year, Cory signed up for a roller league. After that, he started playing ice hockey. Nicole remembers getting dragged around to Cory’s practices and games as a child, and going on family trips, sometimes to Chicago or farther away. One Thanksgiving, the family drove 9-10 hours due to a snowstorm to Cory’s tournament in Chicago, which would normally have been a five- or six-hour drive. “It was a pretty amazing trek,” Nicole said. Cory would play floor hockey for hours on end as a kid, using small nets, tiny sticks and a ball in the hotel hallways with his friends. When he wasn’t practicing with his teammates or playing actual games, he would take shots in a net in the basement, skate or play with his dad. “I just remember always thinking, ‘Don’t you ever get sick of it?’” Nicole said with a laugh. His father didn’t understand all the ins and outs of hockey, so he didn’t critique Cory’s talent. The one thing he would do was challenge his work ethic. “The only thing he would harp on me on is if he thought I was being lazy or if he didn’t think I was playing up to my potential,” Cory said. Cory was tempted to leave Culver Academy after his freshman year. He struggled living away from home and his family. He didn’t necessarily like how structured or disciplined it was with having to wear a uniform every day, keeping his room tidy or waking up at 6:30 a.m. He stuck with it, mainly for the people he was with and for the hockey. It got easier one day at a time. By his second year, he loved it. He contemplated leaving Lincoln during his second year, too. Some things weren’t going well for him, but he turned to his mother for guidance. “If you quit, you’re going to regret it,” she told him. Though Hibbeler has never been the leading scorer, he inspires teammates with his work ethic on and off the ice. His biggest ordeal, however, came his freshman year at Quinnipiac. While the team was on a road trip to St. Cloud State in October 2010, Cory got a phone call from his grandmother late at night. He knew something was up. His mother suffered a sudden heart attack and passed away. “Kind of felt like the same nightmare all over again,” Cory said. Zach Hansen, then a senior assistant captain, was Hibbeler’s roommate in the hotel room and was with him when he found out. Cory flew home to be with his family the next morning. He wasn’t sure if he was going to return to Quinnipiac. He wanted to be with his family 16 hours away in Missouri. Friends, family and coaches all mourned with the Hibbelers. Dalhuisen and Pecknold flew to Missouri for Karina’s funeral. Dalhuisen lived with Cory off campus for the three years they were Bobcats. He had a strong connection with Cory, as he lost his mother when he was 18 to leukemia. When Dalhuisen lost his mother, he faced two options: remain in mourning or make her proud. He offered that same advice to Cory. “Do what you think she would want you to do,” he told him. Cory was gracious for the support from everyone, including Pecknold. 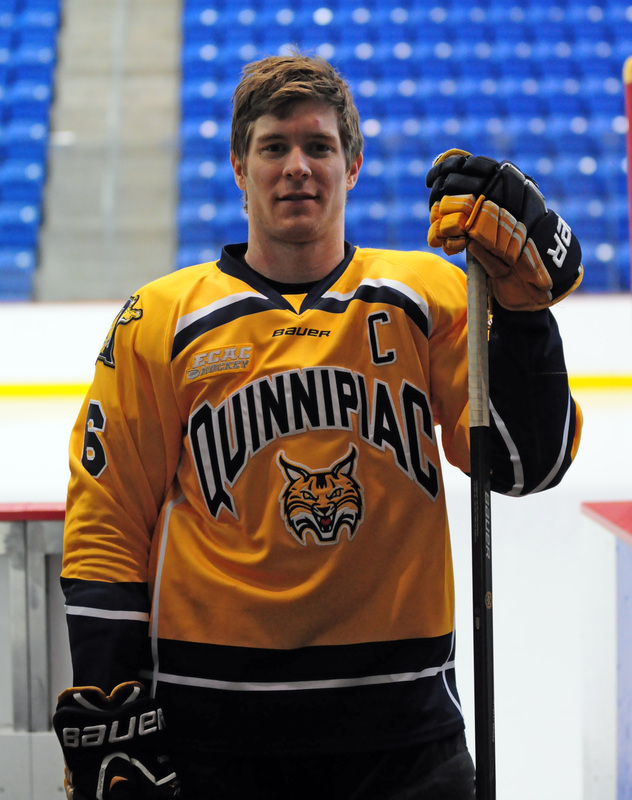 It didn’t matter that Cory was so new to Quinnipiac; he was still one of Pecknold’s players. Pecknold didn’t hesitate about attending the funeral. “I thought that I needed to go and be there for him, whether I knew him that well at the time or not,” he said. There, Pecknold assured him he had a support system at school and everyone would be there for him. “You’ve got a family here at Quinnipiac,” Pecknold told him. Cory said it played a big role for him to return to Hamden. Cory knew his mom wanted him to graduate from Quinnipiac. He returned shortly after. He would write “K.H.,” his mother’s initials, on his hockey stick as a freshman and sophomore. He doesn’t need to do that as a reminder anymore. While the Stars struggled to a 16-36-8 record in the 2009-10 season, Cory still made the most of his time, recording 14 points on the season. But no matter the team’s record, Cory would still be the hardest worker and would do it with a grin that brought positivity to the locker room. Cory hasn’t ever been the leading scorer. In his Bobcat career, he has totaled 18 goals and 16 assists. By comparison, two players this season have more than 35 points. Yet his coaches and teammates say he exemplifies the definition of a captain. Cory does whatever is in the best interest of the team, symbolized by his versatility on the ice. He would push his other teammates to outwork him, even though he would try and outwork everyone. And most of all, he would always wear a smile on his face, as McGroarty remembers. Sometimes, all someone needs is one chance, and that’s what Cory earned. He has scored big goals and been a central figure on the Bobcats’ second-leading penalty-kill unit in the country. He blocks shots and gives a complete effort every shift, Riga said, which energizes the bench into doing the same. 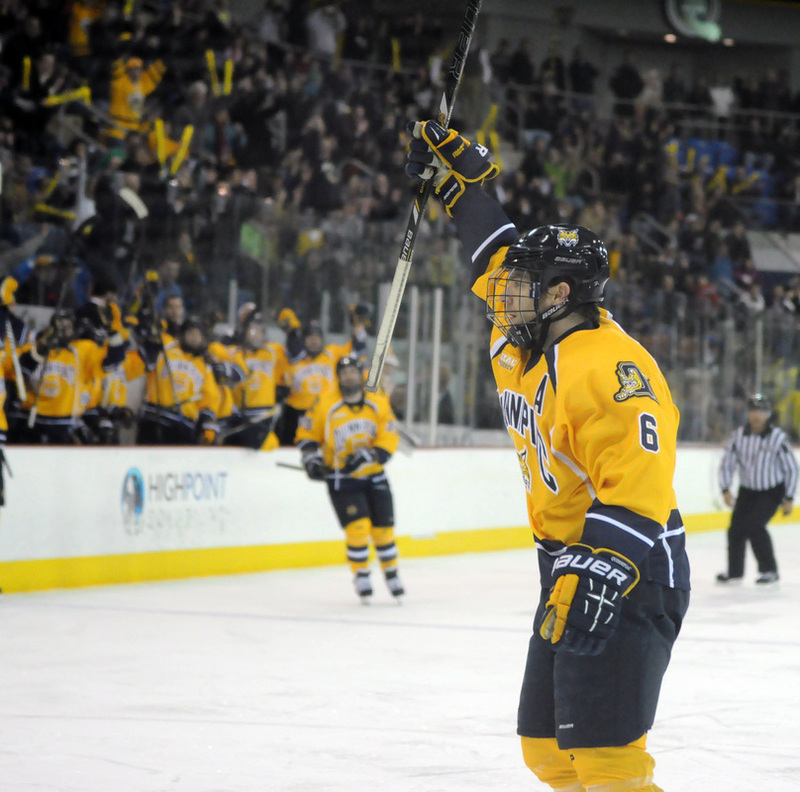 Cory struggled with playing time his first semester at Quinnipiac, playing in only four games. He kept working hard in practice and fought his way into the lineup Jan. 7, 2011, vs. Colgate. Initially, Pecknold was going to have Hibbeler and another player split playing time that weekend, but Hibbeler played so well that Pecknold left him in the lineup. It was the start of a stretch in which he would play 17 of the team’s next 18 games toward the end of the season. He played in 37 of 40 games as a sophomore, 36 of 43 as a junior and all 32 so far this year. “When you battle like Cory did, there’s just no way around it for a coach to not put him in the lineup,” Dalhuisen said. Cory was the only one of his class to have a car as a freshman, so when he and the rest of his first-year teammates -- Kellen and Connor Jones, Zach Tolkinen and Brooks Robinson -- needed a ride up York Hill to the arena, they would call Cory for a ride and all fit in his Ford Explorer. He goes out of his way to make sure he gets each teammate pumped up for the game, whether it’s with a glove tap, his loud voice in the locker room or just his hustle. Even in the weight room, he tries to push people to work harder. He was the only junior to be an assistant captain of last year’s team that reached the national championship game, and he’s the captain of the Bobcats this year, to nobody’s surprise. His sister wasn’t surprised. Neither were Syer, Hansen or the Joneses. The players vote on who the captain is for the year ahead, and Pecknold said it was a near-unanimous vote. “The guys on the team look up to him,” Riga said. At home, nearly 1,000 miles away, Nicole will watch Cory’s games online. If she can’t watch them, she’ll listen to them. If she can’t do that, she’ll constantly check her phone for score updates. But no matter what, she’ll always check the standings. “I absolutely keep track of that,” Nicole said. She rarely gets to see her younger brother play in person, but made the trip to last year’s Frozen Four in Pittsburgh with her uncle and grandma. They were filled with joy, watching Cory accomplish his dream of playing Division I hockey on the largest of stages. She said she wants to make the trip to Philadelphia this year, the site of this year’s Frozen Four, so long as her brother competes in it. No matter how far away his sister is, he knows she is there for him. He knows his parents will always be there, too, watching him play the game he loves. Watching him live his dream. Watching their son continue to live the value of hard work they instilled in him. Read the story on the Quinnipiac Chronicle's website here.